Following the conquest of Constantinople by the Fourth Crusade, a substantial new Frankish presence was added to those in Syria, the Holy Land and Cyprus. Rule was established by those crusaders who remained in Constantinople over the city and adjoining territories, and those areas that had still been under the control of the Byzantine government – Thrace, Greece and the extreme northwest of Asia Minor, together with the Aegean and Ionian islands. The new emperor was elected by a council comprising six Venetians and six Frankish crusaders. The choice of Baldwin, count of Flanders, rather than Boniface of Montferrat, was a genuine surprise, at least to Boniface, but may be explained by Baldwin’s more conciliatory approach to the Byzantines (Lock 1995: 43–5). Another committee decided upon the division of spoils. The Venetians retained one-eighth of the city of Constantinople, the Adriatic coast, the Ionian and Aegean islands (the latter of which were to become the Duchy of the Archipelago), Euboea (Negroponte) and Crete. They established a genuinely colonial maritime empire, ruled through a podestà by the Republic of Venice itself. Most of these possessions were lost to the Ottomans in the fifteenth century, though Crete remained in Venetian hands until 1669. The emperor received the rest of the city of Constantinople, together with Thrace, the northwest region of Asia Minor and the islands of Chios, Lesbos and Samos. He soon found, however, that he had exchanged his strongly centralised county in the West for little more than a glamorous title. Although the partition of fiefs was probably based on recent Byzantine tax registers (Oikonomides 1976: 3–28), Baldwin had little say in the distribution, which meant that he had little opportunity to establish a dynastic base in support of his title. In recognition of his family’s claim to titles held by his brother Renier before 1185, Boniface was granted the barony of Thessalonika. 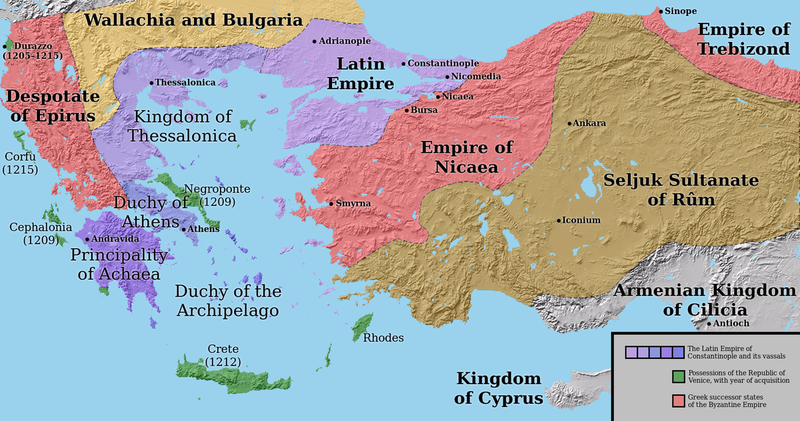 Central Greece and the Peloponnese were carved up between the Frankish crusaders, and eventually settled into the two main power bases of the Principality of Achaia and the Duchy of Athens. A narrative account of the fortunes of the Latin Empire makes unedifying reading. The Empire faced enemies on three fronts: in east and west, the two rival Byzantine successor states of Nicaea, ruled by the Lascarids (who also swallowed up the Komnenos state of Trebizond) and the Despotate of Epiros, ruled by the Angeloi; and the Bulgar kingdom to the north. Baldwin and Boniface were both killed fighting the Bulgars, in 1205 and 1207 respectively. Had the Franks been prepared to recognise the Bulgar kingdom, they might have been able to count on their help against their Byzantine rivals, but Emperor seems to have been deluded by his title into a false sense of his power. In 1208, his successor, Henry II (1206–16) married the daughter of the Bulgar tsar Kalojan, which gave him breathing space to concentrate on defending his empire against the Lascarids. In 1211 he won a victory in Asia Minor that secured his Asian possessions, and when he died in 1216 the Latin Empire was probably at its height. The 1220s, however, proved disastrous. The ‘kingdom’ of Thessalonika, a Montferrat dynastic possession, fell to the Despotate of Epiros in 1224, despite the launch of a crusade from the West by William IV of Montferrat to save it. In 1225 the Nicene Emperor John III Vatatzes (1222–54) drove the Franks out of Asia Minor and was prevented from reconquering Constantinople itself only by the opposition of Epiros. A further stay of execution came in 1230 when Epiros itself was destroyed by the Bulgar tsar John II Asen (1218–41). The Empire had a minor, Baldwin II (1228–61) at its helm, and even the appointment of the experienced former king of Jerusalem, John of Brienne to the position of co-emperor in 1229 could not turn the tide. When John died in 1237, after an adventurous career that had included the captaincy of papal armies in Italy, marriage to the heiresses of Jerusalem and Armenia and the leadership of a crusade, the Latin Empire consisted of little more than the city of Constantinople itself. The end came only in 1261, when the Nicene Emperor Michael VIII Paleologus (1259–82) realised just how weak the Franks were. By that stage, the unfortunate Baldwin II had been reduced to selling or pawning anything of value, including the remaining relics, the lead from the palace roof, and even his own son. One corner of Frankish Greece, however, provided a model of strong and successful feudal colonisation. The Villehardouin dynasty established itself in Morea (Peloponnese) and between 1209 and 1259 enjoyed secure and peaceful rule over the Principality of Achaia. William II of Villehardouin (1246–78) conquered the whole of Morea, and made himself overlord of Negroponte, the duchies of Athens and the Archipelago. The constant warfare that weakened the emperors in the north also acted as a screen to protect the more remote Morea, with the result that the Villehardouin princes were able to consolidate centralised feudal authority with little external threat. Alongside their Frankish fief-holders they also ruled over the remaining Byzantine archontes (landowners), using French feudal customs enshrined in a written code of law. After 1266, following the defeat of William II by the Lascarids in 1262, the Principality survived only as a vassal state of Charles of Anjou’s Sicilian kingdom. In the fourteenth century it disintegrated under the growing strength of the new Palaeologan regime in Constantinople, and as a consequence of the seizure of the duchy of Athens by the Catalan Company (1311), a group of mercenaries from northern Spain. During its zenith, however, under Geoffrey II (1229–46) and William II, the Frankish court of Achaia enjoyed a reputation as a centre of traditional chivalric culture. William II, who participated in Louis IX’s crusade in Egypt (1249–50), built a palace at Mistra whose grandeur can still be appreciated today. The weakness of the Latin Empire must be seen in the context of wider collapse in the region. That the crusaders had triumphed in 1204 with a small army (about 20,000) over the defences of the largest city in Christendom says more about problems within the Byzantine imperial system than about Frankish military strength. The Byzantine Empire had suffered five changes in regime between 1182 and 1204; loyalty to the emperor was so loose by 1204 that the Greeks of Thrace were quite prepared to recognise a Latin as just another in a succession of emperors. The Franks never had sufficient military strength, nor could they mobilise western colonisation as the settlers in the Holy Land after 1099 had been able to. But if the Franks were hopelessly weak, their rivals were scarcely stronger. The Latin Empire was therefore ‘an additional element in the regional mosaic of princelings’ (Lock 1995: 55); they were distinguished only by their possession of the ‘queen of cities’ herself. 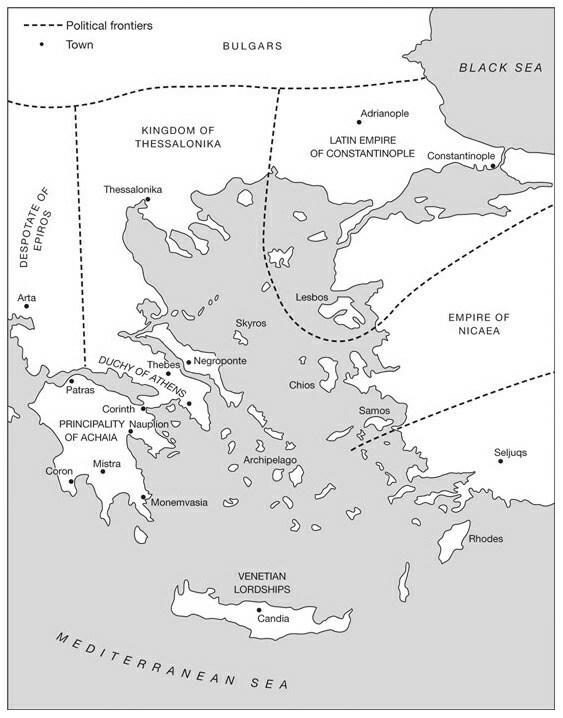 The Latin Empire was a symptom of the breakdown in power in the northeast Mediterranean. The Latin Empire may have been weak, but that does not mean it was unimportant in the political life of Europe. Popes until the mid-thirteenth century saw it as a vital component in the Crusader States. There is no reason to suppose that Innocent III’s reference to the Frankish settlers after 1204 as ‘pilgrims’ was simply conventional phrasing: like Gregory IX (1227–41), he was probably sincere in the belief that the best hope for the Holy Land lay in securing a bridgehead to control the passage from West to East. Thus Gregory saw a crusade against Nicaea (1237–9), which never in fact materialised, as part of the wider effort to protect the Crusader States. Here the papacy seems to have been out of step with western opinion (Barber 1989: 111–28). Although individual rulers such as Charles of Anjou (1266–85) were prepared to invest in Frankish Greece, the cause of the Latin Empire had little resonance among potential crusaders. Richard, earl of Cornwall, for example, resisted papal pressure to commute his vow for the Holy Land to the Aegean in 1239. The failure of the Latin Empire to appeal to western crusading instincts can also be seen in the large numbers of Franks who took service in the Byzantine armies of Nicaea or the Despotate of Epiros after 1204. Frankish mercenaries were prepared to commit horrifying acts of violence against the ruling Franks on behalf of their employers, as for example in 1210 when Adamée de Pofoy and a group of his knights were crucified in Thessaly by western knights fighting for the Despotate. Papal policy changed, perhaps to conform to public opinion, under Innocent IV (1243–54). Seeing that there would never be sufficient western interest in propping up the failing régime in Constantinople, he recognised the legitimacy of the Orthodox patriarch of Constantinople in exile, and initiated a more conciliatory policy towards Orthodox Christendom in general. This change in papal policy surely contributed to the revival of Byzantine authority and the eventual downfall of the Latin Empire. Relations between Franks and the indigenous Greek population were, as may be supposed, often strained. Yet it may have been the confrontation with unfamiliar and – according to the Byzantine view – erroneous religious customs that proved most offensive to the Greeks. As in the Crusader States in the Levant, Orthodox monasteries and the parochial system continued to function. The difference between the twelfth-century Crusader States and the situation in Frankish Greece and Cyprus in the thirteenth century, as well as in Syria and the Holy Land, was the more intensive level of papal oversight. In part, this may have been caused by the suspicion that Greek monasteries were collaborating with the rival régimes of Nicaea and Epiros (Lock 1995: 227), but on the whole this changed situation reflected new directions in papal policy under Innocent III and his successors. Where the Latin Church in the twelfth-century Crusader States seems to have made little trouble over the observance of Orthodox customs that ran contrary to Latin norms, in Frankish Greece there was less tolerance of difference in customs relating to fasting, the Eucharist, consecration and holy orders. Latin oversight was aided by the arrival of new religious orders, notably the Franciscans and Dominicans, who were valuable agents on behalf of papal policy. A dozen Cistercian monasteries and nunneries were also founded in Frankish Greece, reflecting the involvement of the order in the Fourth Crusade (Brown 1958: 63–120; Panagopoulos 1979). Nevertheless, the number of Franks was always small compared with Greeks, and consequently there was little attempt outside Constantinople and Thessalonika to impose a Latin parochial system on conquered territory. This meant that there must often have been little alternative for isolated Frankish communities to sharing churches or even attending Orthodox services, and even in the early years of the settlement Pope Innocent III worried about Franks adopting Orthodox religious customs. By the fourteenth century, Venetians in Crete who ‘went native’ were a serious concern for the papacy. It is probably going too far to describe the Frankish settlement as a process of acculturation. As one historian has observed, the occupation was too brief and too limited geographically to be ‘anything other than a curdling, rather than a true intermingling’ (Lock 1995: 266). Because Frankish and Greek communities lived largely separate different existences, however, it does not follow that they were necessarily hostile to each other. Although historians, naturally enough, dwell on violent incidents such as the anti-Latin riots of 1182, and examine the polemical discourse against Latins in the Orthodox tradition, there is a danger in overplaying this type of evidence. There was little anti-Latin resistance in Frankish Greece in the thirteenth century, and although polemical writing continued to be produced in monasteries and schools, it was not representative of how the societies interacted. Once ‘a caricature became a person with a face and a name, cooperation, friendship and conjugal fidelity were thought possible’ (Lock 1995: 274). We may even question the extent to which 1204 really marks a cataclysm in Byzantine history. For one thing, creeping ‘westernisation’ during the twelfth century had accustomed cosmopolitan Byzantines to the sight, sound and customs of Franks. It has been estimated that before the last quarter of the twelfth century there were between ten and twenty thousand western merchants and their families in Constantinople; marriage between Italian merchants and Byzantine women was, moreover, encouraged by imperial policy (Magdalino 1993: 27–108). At the middle and lower levels of society in particular, the Latin conquest offered possibilities of social and professional advancement, and it may be in this largely undocumented hinterland that something like a hybrid society developed. Even for those Greeks who were unwilling to cooperate actively, or in the provinces where Franks were thinly spread, the resentment against them may have been no greater than that felt for any ruling élite. In the provinces, land was redistributed, but the impact of this was greater for the pre-1204 élites than for those who actually worked on the land. The Frankish effect on institutional life was minimal. Although some French feudal terminology crept into the everyday speech, few place-names seem to have been changed. Debates over whether the Franks introduced feudal landholding arrangements have been inconclusive. The age-old Byzantine system of pronoia – a grant of land or privilege in return for services to the grantor – looks on the surface rather like western feudalism anyway, with the exception that the grant was typically for the lifetime of the recipient and not hereditary. After 1261, Emperor Michael VIII seems to have made some grants of pronoia hereditary, which may indicate residual Frankish influence. 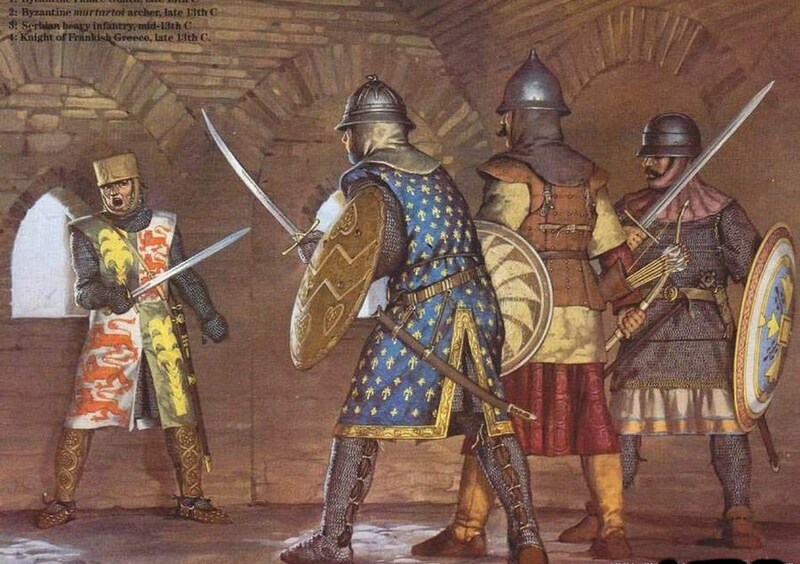 Even this, however, may simply have been a stage in the process of westernisation that can be seen in the twelfth century, in Emperor Manuel Komnenos’ adoption of chivalric concepts such as the tournament and dubbing to knighthood. The Frankish occupation of Greece, therefore, may be seen as a stage in a process, rather than as the sole cause of the eventual decline of the Byzantine Empire. This entry was posted in Crusades by MSW. Bookmark the permalink.